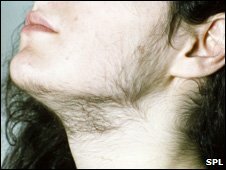 Excessive hairiness in women is not just a cosmetic problem but is likely to be a sign of an underlying medical condition, say UK doctors in a report. Report author, Dr Rebecca Swingler, a specialist registrar in obstetrics and gynaecology at St Michael's Hospital in Bristol, said the condition, known as hirsutism, is distressing and can be particularly upsetting for young women. Estimates of how many women are affected are likely to be underestimated because women can be reluctant to seek help, she added. Mild cases can be treated cosmetically, she said, but in moderate to severe cases, hormone therapy, such as the oral contraceptive pill and other treatments are available. Weight loss, especially in obese women, may also help reduce high levels of the male hormone testosterone which can be an underlying factor in cases of excess hair. "Often women have spent many years trying to cope with their hirsutism before they seek professional help," said Dr Swingler. "Women need to look at themselves in the context of their family and ethnicity and what is 'normal' for them. "If they notice a change in the pattern of hair growth or they notice they having to wax more often then they should seek help," she said. They may also not realise hirsutism could be linked to a condition like PCOS because symptoms such as irregular periods are not present, he added. Professor Franks said how much hair growth was considered excessive was subjective, but that women should not be afraid to seek help. Rachel Hawkes, chairwoman of PCOS charity Verity, said many women with excess hair growth did not actively seek treatment because they were embarrassed. "The effect that excess hair can have on a woman's self-esteem and how she views herself as a woman - and therefore her quality of life - can be extremely distressing. "We recommend women with PCOS who suffer with excess hair growth seek the advice of their GP, or ask to be referred to an endocrinologist or dermatologist."